Awesome typography projects are our favorites so we’re giving you another inspirational work from one of the most amazing paper craft illustrators out there – Lobulo Design. For more than a decade, Javier Rodríguez García the creative mind behind Lobulo Design in London has been successfully working with various graphic design and marketing studios using his unique skills in design dominantly in striking pieces of paper crafts. His recent project called “Atype” caught our attention which showcases how can the things around us can create a variety of creative concepts and 3D type treatments when applied in a flat letter. YTD: Hi Javier, welcome to You The Designer! Tell us something about you and your creative work. LOBULO: Well, I actually do paper-craft illustrations since 2009, but I worked as graphic designer for many years in Barcelona. Tired of being all day working on the computer, I decided to focus my career on illustration. Since then, I have worked with clients from Europe & USA, like Oprah Winfrey, Sparkle Telecom or Tesco. And also collaborated in exhibitions around the world for New Era or Lazerian. YTD: Your recent project called “Atype” caught our attention. What is it all about? LOBULO: I did this project to explain that whatever you want is possible without High-tech tools, just playing with your hands. Sometimes we forget that there are other existing ways to create new things without the use of computer. YTD: What is the guiding principle behind it? 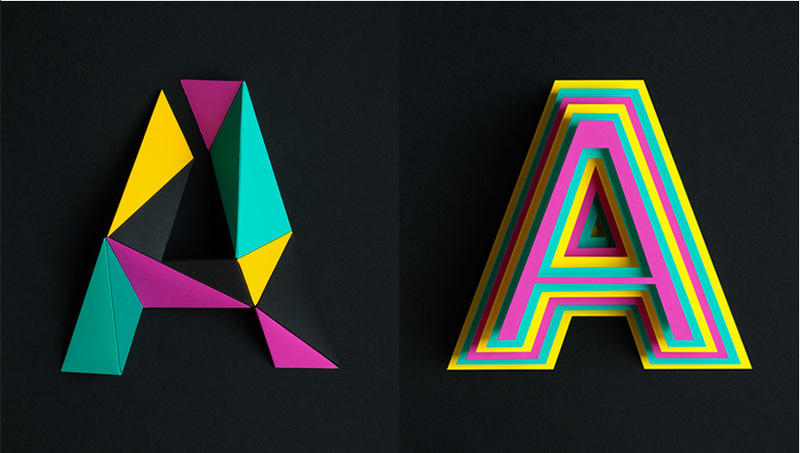 YTD: Share to us the creative process behind making the 3D type. From where did you start? LOBULO: The first thing I do when I take a new project is researching info about the references and create a moodboard for this project about lettering and signs. The second step is how to find the easier way to explain how to make it. Most of people in graphic design feels scared when try to work without computer, scared to do mistakes, scared not to use Ctrl+Z. YTD: Which of the 3D models is your most favorite? YTD: Any future plans for this project? LOBULO: To being honest… probably I’ll try to do more thing with letters. But a little bit more complexes. Check out Lobulo’s website for more info or head over his Behance portfolio for more of his awesome projects. What do you guys think about this project? Share us your thoughts and suggestions in the comments!